It's not exactly a tourist attraction, but if you are a Katharine Hepburn fan and you happen to be in Hartford, you may want to pay your respects to the late star of more than 75 films by visiting her grave site. 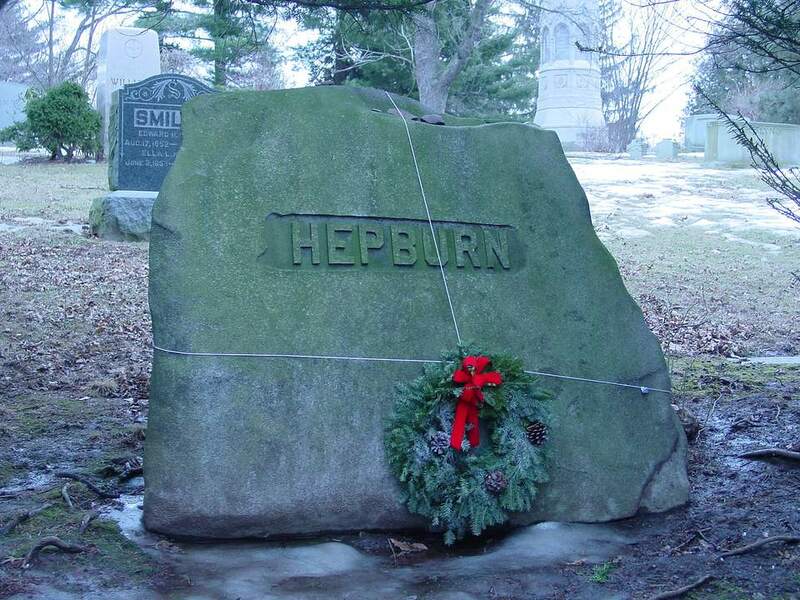 Hepburn was born in Hartford, Connecticut, on May 12, 1907, and following her death on June 29, 2003, she was buried in her family's plot at Cedar Hill Cemetery. Cedar Hill Cemetery is located at 453 Fairfield Avenue in Hartford, and gates are open from 7 a.m. until dusk daily. The historic cemetery dates to 1866 and is listed on the National Register of Historic Places. Exploring the cemetery's scenic grounds is one of Hartford's overlooked but most intriguing free things to do. On a nice day, the cemetery is a peaceful and contemplative place for a jog or stroll. Many of the historic headstones and tombs are works of art and fascinating monuments to the passage of time. The layout is a bit unpredictable, so you may want to take a look at the cemetery map (.pdf file) before your visit. Katharine Hepburn's grave is located on the west side of Section 10 at Cedar Hill Cemetery. Look for the large boulder engraved with the family name (pictured above) and a smaller, flat stone marking the burial site of the actress. For more information about touring Cedar Hill Cemetery, call 860-956-3311, or visit the Cedar Hill Cemetery website. The Cedar Hill Cemetery Foundation offers a number of special tours and events for curious visitors from May through November including themed and highlights tours, bird walks, stargazing nights, a butterfly hunt, concerts and October's popular Hallowed History Lantern Tours. On August 22, 2019, there'll even be a screening of On Golden Pond, starring Hepburn, under the stars at the cemetery. Called "The Kate" by locals in Hepburn's home town, this intimate theater opened in 2009—six years after the actress's death—in a stately circa 1910 building that formerly served as Old Saybrook's town hall. The world's only theater named after Hepburn hosts concerts, theatrical performances, comedy shows, HD movies and an annual Oscars party. A museum in the lobby displays photographs and other Hepburn memorabilia including her Emmy Award for Love Among the Ruins. Although Fenwick, where Hepburn died at her beloved family home, is a gated community closed to the public, you can drive along Route 154 for a glimpse of the Long Island Sound views she cherished. The Hartford-born firearms inventor and manufacturer revolutionized gun production with his assembly line and system of interchangeable parts. He and his wife Elizabeth, who outlived him by more than four decades, are buried in Section 2 of the cemetery. John Pierpont Morgan, famed financier, backed the Edison Electric Company—wouldn't you have loved to see that on Shark Tank? It was far from his only good bet, and he left quite a fortune when he departed this world. You can see his monument, inspired by the Ark of the Covenant, in Section 11 of the cemetery. An insurance company job brought Wallace Stevens to Hartford, but it's his poetry—which earned him a Pulitzer Prize—that outlives him. Find him in Section 14 of the cemetery. Staying Over? Compare rates and reviews for Hartford hotels with TripAdvisor. Or, if you want to stick with the theme, book the guest room named for Katharine Hepburn's mother at Three Stories Guest House at the Saybrook Point Inn in Old Saybrook. Katharine Martha Houghton Hepburn was a notable suffragette.